Today we repeated the trip from Rio Verde to Palomas and repeated the stops from previous occasions, starting with the Ariocarpus retusus ‘scapharostoides’ stop. Again, I searched in the ‘forest’ around Pylon #1, to no avail. The vegetation was too lush, hiding the thorns on the Acacia trees, while trying not to slip over as the cows had ensured that often I was almost ankle deep in manure. The others had walked straight on to Pylon #4 where the same plants seen in March were photographed again, this time surrounded by grass and Tagetes with their yellow flowers, but no flowers, or buds or evidence of spent flowers on the Arios – we’re still not sure if we have missed the flowering season or are too early (S3153). S3154 was a quick stop for a mass (or mess?) of epiphytic cacti hanging from the tree branches – Disocactus? Hylocereus? Also lots of Tillandsia. S3155 was for a location for which Ian had data for Lophophora viridiscens. He came back to the car disappointed, as the coordinates were now at the bottom of a reservoir, under meters of water. While he had been tracking the location down, we had wondered about the place and had found Ariocarpus kotschoubeyanus, Lophophora viridescens, Mammillaria sp, Coryphantha maiz-tablensis and Echinocereus enneacanthus and E. pentalopus. S3156 was a random toilet stop, but while we were waiting for Cliff to catch up (their car had low ground clearance so could not keep up unless risking losing the exhaust), Alain had managed to find some Lophophora williamsii ‘koehressii’ – I remain unconvinced about these form names. Aian there were epiphytic cacti, E. enneacanthus, C. maiz-tablensis and large Sclerocactus uncinatus. For S3157 we were back at ‘michelinman’, a massive Echinocactus platyacanthus, growing close to the largest Ferocactus histerix that I have ever seen. 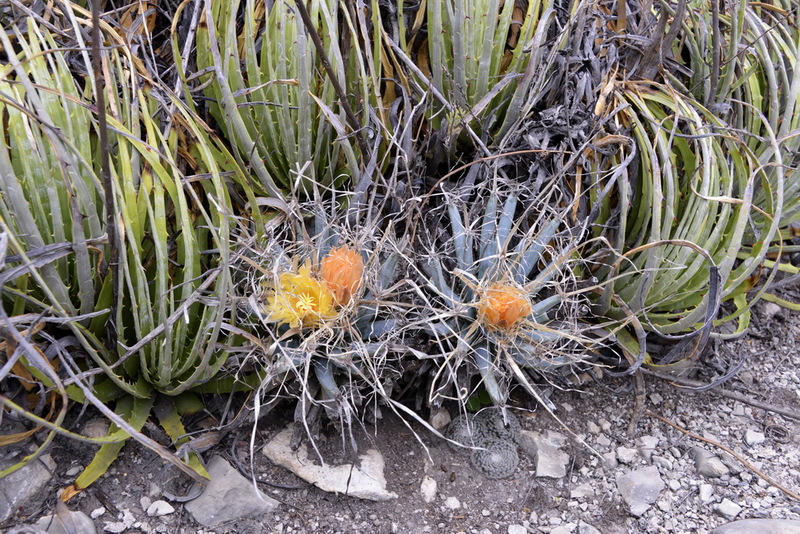 One more stop, S3158 for Leuchtenbergia principis was nearly at the crossroads for the main road to Ciudad del Maiz. By now it had started to drizzle. Ian not only found the Leuchtenbergia but managed to find it in full flower – another candidate for my wall back home! (It’s picture that is). The drizzle became harder once we were back in the car and was quite persistent when we found a hotel with running water (through the yard) and a good restaurant almost next door. Let’s hope the weather clears a bit, I don’t really fancy ‘cactus in the rain’ as a theme for a future talk.